Lacoste Essential is all about the spirit of freedom, enjoyment & relaxation. 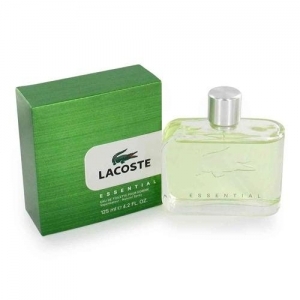 Lacoste Essential For Men EDT 125ml. - Romantic, brave, laid-back flavor, addressed to a young man who loves change and freedom, eternal wanderer, looking for new experiences and looking to the future with optimism. Independence of spirit - that is its greatest asset. Scent of freedom, dynamic and pulsating, opening new horizons. Thanks to new technology Time-Release Technology fresh flavor saved the day. It is all about the spirit of freedom, enjoyment and relaxation - not just specifically relaxation and enjoyment as regards activities, but also freedom of mind. The fragrance comprises top notes of tomato leaves, citrus, fruity and watery notes. The scent's heart is made of black pepper and a floral accord, including rose notes. Sandalwood and patchouli notes are in the fragrance's drydown. "Time-Release Technology" is used which allows the juice to maintain its initial freshness throughout the day. The wearer needs only to rub the skin where the scent is sprayed on in order to break molecules that then release the aroma of its top notes. The essential bottle is innovative, modern and classic. The brushed aluminium cap adds a prestige touch to a unique bottle. The engraved crocodile and emerald green juice perfectly encapsulate the spirit of Lacoste.